DNA contains the sugar deoxyribose, while RNA contains the sugar ribose. The only difference between ribose and deoxyribose is that ribose has one more -OH group than deoxyribose, which has -H attached to the second (2') carbon in the ring. DNA is a double stranded molecule while RNA is a single stranded molecule. DNA is stable under alkaline conditions while RNA is not stable. DNA and RNA perform different functions in humans. DNA is responsible for storing and transferring genetic information while RNA directly codes for amino acids and as acts as a messenger between DNA and ribosomes to make proteins. DNA and RNA base pairing is slightly different, since DNA uses the bases adenine, thymine, cytosine, and guanine; RNA uses adenine, uracil, cytosine, and guanine. Uracil differs from thymine in that it lacks a methyl group on its ring. Function Long-term storage of genetic information; transmission of genetic information to make other cells and new organisms. Used to transfer the genetic code from the nucleus to the ribosomes to make proteins. 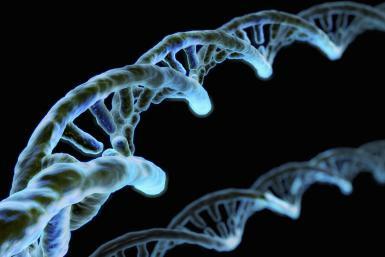 RNA is used to transmit genetic information in some organisms and may have been the molecule used to store genetic blueprints in primitive organisms. Structural Features B-form double helix. DNA is a double-stranded molecule consisting of a long chain of nucleotides. A-form helix. RNA usually is a single-strand helix consisting of shorter chains of nucleotides. Propagation DNA is self-replicating. RNA is synthesized from DNA on an as-needed basis. Reactivity The C-H bonds in DNA make it fairly stable, plus the body destroys enzymes that would attack DNA. The small grooves in the helix also serve as protection, providing minimal space for enzymes to attach. The O-H bond in the ribose of RNA makes the molecule more reactive, compared with DNA. RNA is not stable under alkaline conditions, plus the large grooves in the molecule make it susceptible to enzyme attack. RNA is constantly produced, used, degraded, and recycled. Ultraviolet Damage DNA is susceptible to UV damage. Compared with DNA, RNA is relatively resistant to UV damage. About Education in your inbox. © 2016 About, Inc. — All rights reserved.